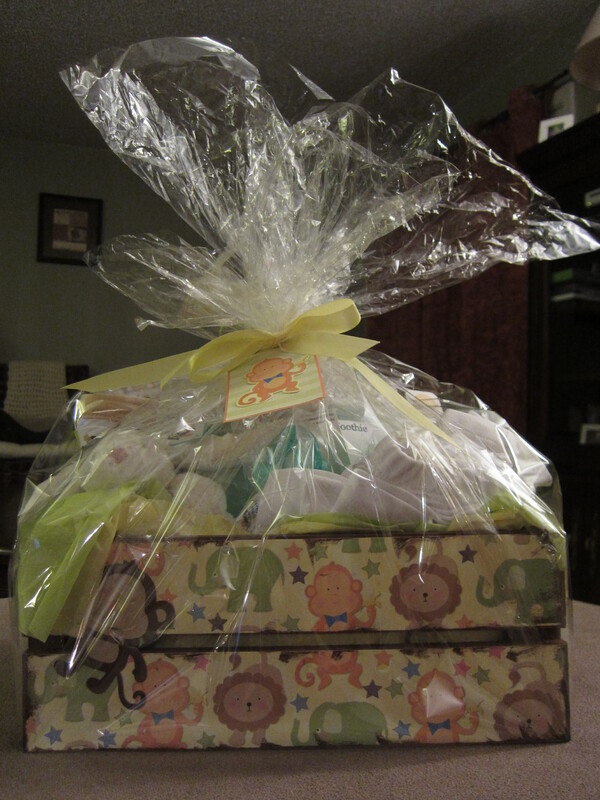 Such a sweet gift. I know it must have been hard to pour so much of yourself into it, knowing it was for her baby and not yours. But this will be a niece/nephew that, at some point, will be very much part of your life. Right now it is hard- don’t expect it not to be. You are on the right track. You are strong and beautiful. I’ll be thinking of you tomorrow. Thank you, Tutti. Your words always mean so much to me. I know I’ve said this before, but I can SO relate to the struggles you go through with your sister. I constantly try to be there for my sister and she never acknowledges it or shows any sign of thankfulness. When she tries to do something for me, it’s always so robotic. It’s like a job rather than something that comes from the heart. I know she has built up many walls over the years from each time someone has hurt her but she won’t admit to this nor does she show any signs of trying to break down the walls to let people in. In the end, it just ends up hurting those closest to her and pushing them further away. I hope you and your sister are able to have a good relationship at some point. I’m sure it will take some time and probably a few heart to heart talks and some more ups and downs, but I hope the ups eventually become more frequent than the downs. I take such comfort in knowing you can relate, sams! Thank you for the support. What a beautiful gift! I’m glad that you will be able to do some things that you really enjoy tomorrow in the midst of a painful experience. Good luck, brave woman! Thanks for the info about provera. I’ve heard it can take up to 14 days, but it never has for me and I’m itching to get a move on. And always, thanks for your kind words and support. You’re such a kind soul. Remember to be kind to yourself too. You are ever in my thoughts and I will send all my good vibes to you tomorrow. I hope the day turns out better than you expect or hope and your sister appreciates the very thoughtful gift. Many hugs to you! That is such an amazing gift. You are very talented. I’ll be thinking of you tomorrow. Hope the shower goes well and then you have an excellent night with your husband and daughter. Thank you so much for those kind words. I hope so too! Love the gift! Praying for you as you travel. May God prepare your heart for the moments spent with other women celebrating the baby to come. Such a good idea to “sandwich” it between things you love. Good job! Thinking of you! Mmmm….alcohol. That DOES sound helpful! What a beautiful gift you made for your sister! She is so lucky to have a sister like you who goes above and beyond your own personal pain to make things wonderful for her. It takes a very strong person to do what you are doing. I’ll be thinking of you today and wishing you peace and strength to get you through the festivities. I hope your sister appreciates this thoughtful gift and that you have a wonderful time with your family before and after the shower (if not during!). Thank you for the constant support, Daryl. I’ll be writing a post on it later, but suffice it to say, I survived. It was hard, but the rest of the day was great and that made up for it. One more thing–how did you make the box? Is it painted or did you use paper? If it is paper, how did you get it to stay on? Sealer? I am looking for new hobbies and have tons of materials, but have never actually used them. The box is very easy to do! I purchased an unfinished wood box from JoAnn’s Fabrics, sanded it, and then painted it, inside and out (several coats). After that, I applied printed paper (cut to fit) to the outside of the box and made it stick with Mod Podge, a type of sealer & glue available at craft stores. 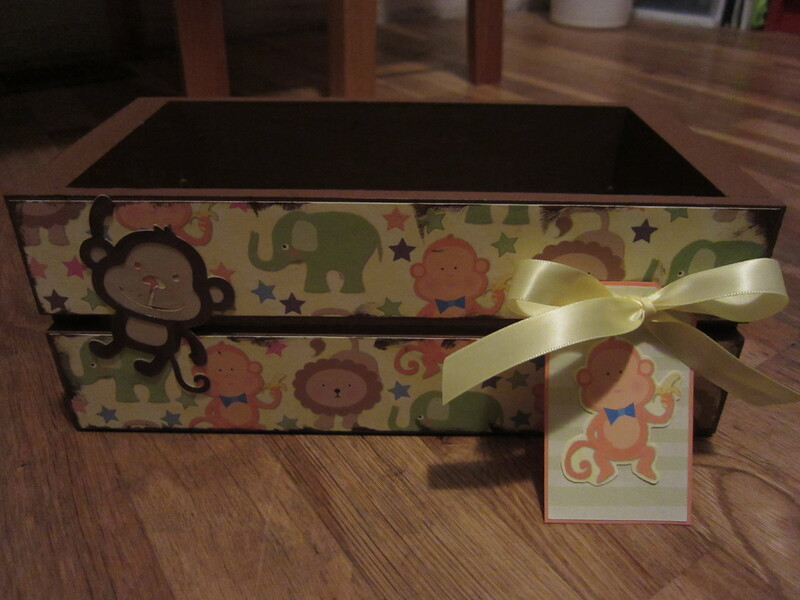 (I used different, but coordinating, paper for the ends of the box than I did for the front and back of it). I then distressed the edges to give it a little bit of a finished look and added a couple monkeys that I made on my Cricut machine (large sticker decals bought at Michaels or JoAnns would work too, or you can just leave them off). I don’t enjoy sewing and can’t crochet/knit, so this is a nice way to give a unique homemade gift for weddings, babies, and more. It takes some time, but it is a lot of fun and keeps my mind busy when times are hard. Sounds like fun. I am really inspired! I hope that your Saturday was better than expected and that you managed to find happiness and enjoyment in some surprising moments. These days are not easy, but you seem to handle them with grace. The gift is beautiful and I hope that your sister appreciated it. If she didn’t, please don’t let that sit too heavily on your heart. I believe that there are some things that people who have not been in our shoes simply cannot understand (although that doesn’t mean they can’t empathise…). I also so hope that your effing period shows soon. The waiting really is the hardest part (thank you, Mr. Petty).